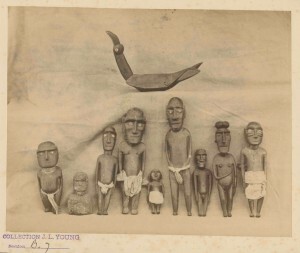 This entry was posted in Historical photographs, Pacific culture, Research by Anna Blackman. Bookmark the permalink. this is a letter coming from Stuttgart/Germany. I am an artist(painter) and rongorongo – not a script – is my research during the last 25 years. I published in Scientific Journals but now you can read texts on my website, sorry, but in my mother language, german.The photographs of the KEITI are on great interest for my rongorongo research: The quality of the picture on your website is bad, impossible to decipher any of the glyphs. Do you have better prints and how can I get it? Researchers can purchase copies of items in the Hocken Collections by contacting us either via email hocken@otago.ac.nz or phone 4798868. Good luch with your research. Hello, Anna I am interested in the images of the JLY collection( James Lyle Young) at in the Hocken collection. Can you let me know how many images you have and if the material also includes pacific objects other than Easter island? I am trying to contact Rafal M. Wieczorek. Do you have an email? I have some personal research done on rongorongo I would like to share with him.